Many times we're asked how to remove the front sight from an AR2078, AR2078A or AR2079 air rifle. It looks as if it should be easy, but there's a simple "trick" to do it. Here we'll show the removal in photographs. 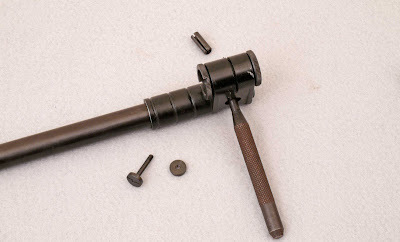 First, remove the small setscrew holding the barrel weight in place. (First photo). Now, you can pull the barrel weight back off of the AR2078 barrel - don't scratch the finish! Our second photo shows the removed weight and setscrew. Now remove the screw and slotted disks. This is obvious and it looks as if the front sight should now slide off. But it doesn't! 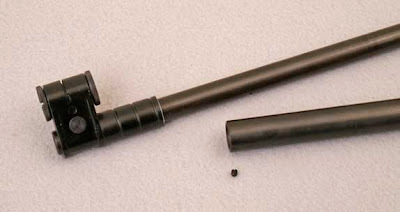 The secret is that there's actually a spring steel roll pin holding the sight assembly tight to the barrel. You can see it if you look carefully at the next photo. 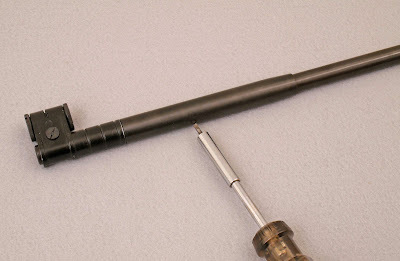 Take a 7/32-inch steel punch and knock out the roll pin from its' "pointed" side, as is shown in the fourth photo, below. 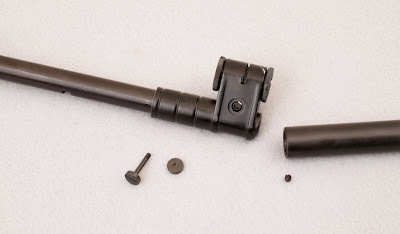 Once the roll pin is out, the front sight assembly will simply slide off of the barrel, leaving you with the result in photo 5. Having removed the front sight, you are left with a flat in the underside of the AR 2078 barrel for the setscrew seating and an unpleasant semi-circular slot in the top for the roll pin. A muzzle brake will cover these if it is long enough. In practice, I find that the barrel weight removed in stage one can be epoxied back in place around the front of the barrel - this makes a nice, clean job and this is how I finish our AR2078A "Custom" air rifles. 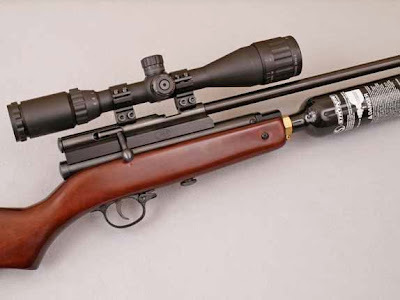 One well-known problem with the Industry Brand QB79 air rifles is that a standard 2-inch diameter paintball tank will often touch the barrel of these air rifles - with a consequent bad effect on accuracy. To be fair, this is not actually the fault of the Shanghai Airgun Company, as the outside diameter of (nominally) 2-inch diameter paintball tanks has increased over the years and now stands at about 2.10 inches. With bad luck, this can cause the tank to contact the barrel when full and fitted. 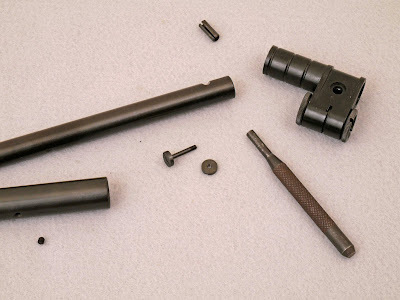 Enter the JRA Breech Spacer Kit (photo above). 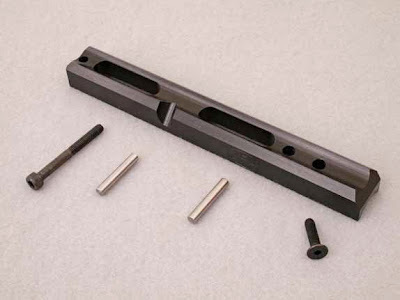 This provides an additional 5/16-inch (8mm) of clearance between the barrel and tank on a QB79 or AR2079A air rifle. Archer Airguns has them in stock and also includes replacement transfer port tubing that will increase the muzzle velocity as well (not shown in our photograph)! The barrel then becomes free-floating as it's not possible to use a front band for support with any QB78 air rifle. I've not found this to be a problem in testing, however. 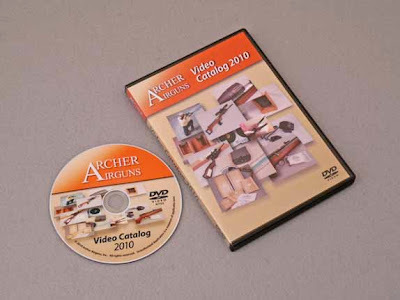 If you are purchasing a new QB79 air rifle and don't want to fit the spacer yourself, Archer Airguns will fit it to your new QB79 for a very modest fee. Our photo below shows the Breech Spacer Kit fitted to a QB79. The increased clearance is evident. This is an excellent addition to your QB79 at an attractive price.